Own a piece of history with this spectacular Craftsman in the heart of Eagle Rock. 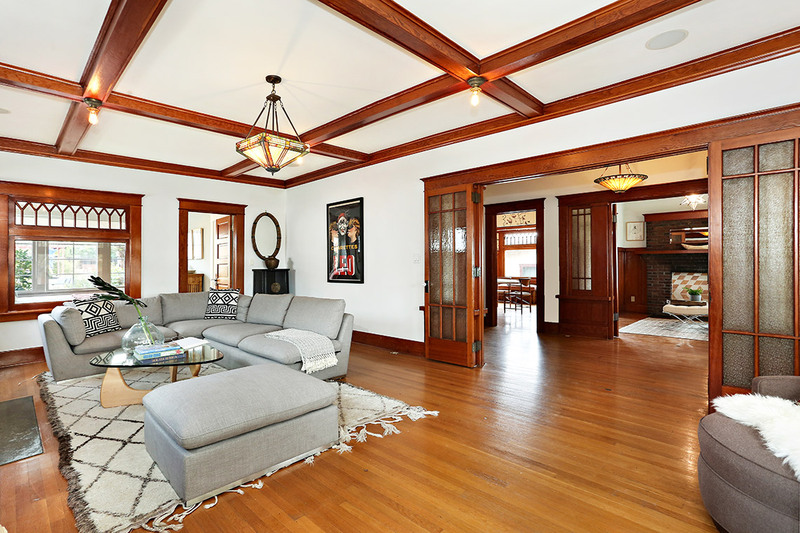 Commissioned by George E. Cox, prominent dentist & 1911 elected mayor of Eagle Rock, almost every architectural feature is intact – from the beveled/etched leaded glass to ceiling box beams, gorgeous oak floors & batten wainscoting. Grand living room w/brick fireplace & exquisite woodwork. Head through cozy sitting room/library w/fireplace into stunning dining room w/character cabinetry & beautiful natural light. Kitchen is thoughtfully updated and expanded to include large kitchen island, modern stainless appliances & French doors leading to the delightful backyard. Upstairs features 3 large, sunny bedrooms w/tons of closet space & plenty of cozy nooks to curl up with a book. Spacious, deco tiled bathroom is overflowing w/charm. A fourth bedroom/den downstairs & full bathroom complete the expansive floor plan. Head out back to dine alfresco under the vine covered pergola, or swim in the sparkling pool!